Sushi has got to be one of my favorite comfort foods. But I agree. Don't go frying my sushi. Were there a lot of Japanese diners there? That,to me, is a big indicator of if a restaurant is any good. Great review and some excellent photos. I am curious as to the pricing. Is that a standard range for sushi in OC? That seems rather expensive to me. I know I am in landlocked Phoenix, but we do get some decent sushi here that is well below that in cost. Reading your post has given me a really good idea Elmo. 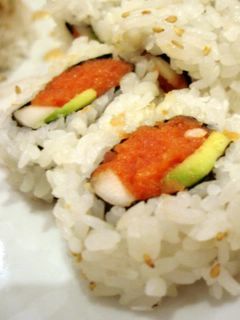 You see, my favorite sushi roll is California Roll, and my bf loves anything with sashimi. We always bicker like arch enemies over which rolls to order. 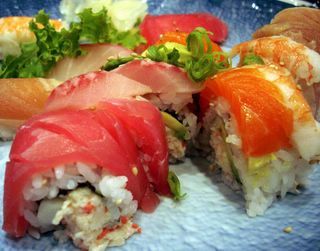 Now, I think I'll learn a trick from you and order the Rainbow California Roll and Mitsui California Roll (if they have an equivalent at the restaurant I am at). That way, I can have my favorite, and so can my bf. 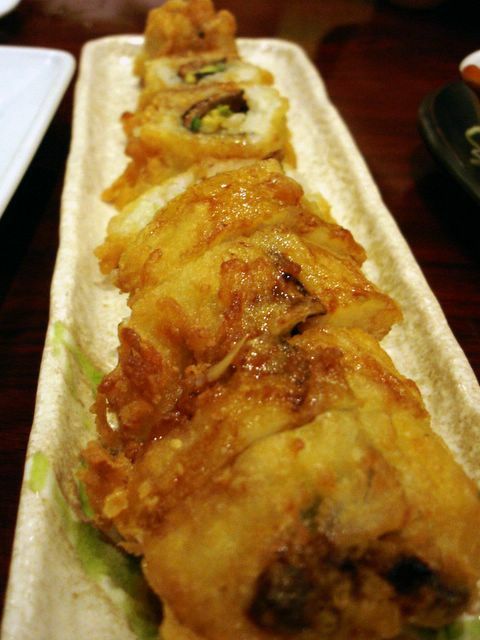 have you tried ango tei right in front of mitsuaw market on paularino? oh yeah pictures look so yummy! Aaah, another Cali-Sushi joint. They seem to be popping up everywhere! Actually, now that you mention it, most of the customers weren't Japanese or even Asian. If I can attempt to classify them, they belonged to California Roll Crowd than they are of Uni Sect. But then so was I that night...I was in the mood for something simple and satisfying. Believe or not, the prices are pretty typical of sushi joints around these parts. I actually had a 15% off coupon which blunted the sting a little. That said, we were pretty stuffed by the end. I've heard of Ango Tei and have been meaning to go, and I know exactly where it is, but always seem to get sidetracked. What's not to miss there? Yup! It's a sushi BOOM! In fact, there should be a place called Sushi BOOM! (with the Exclamation Point!) I'd eat there. cool... my friend lives up in quail hill, will go check it out..
went to Stricklands the other week with my friends and it was as good as you described it... she's hooked though, checking the emailed flavors of the week and rearranging her schedule around it... pretty comical..
hey elmo.. still no Roma D'Itlaia posting????? wassup wit dat???? have you tried taiko near the corner of jeffrey and walnut in irvine? if you plan on having sushi, i suggest eating at the sushi bar, it won't be the same if you don't. certain items you can only order from the sushi bar as well. 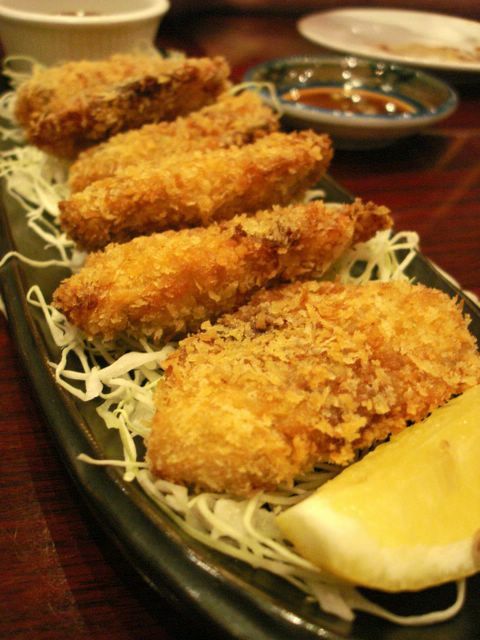 seems like you've had some bad experiences with deep fried sushi, but if you get a chance to eat here, order the deep fried special aka #5. it's not on any menu, it's more of a secret menu like the one in-n-out has, there's a #1 though #5, for the curious. give it a try, i'd definitely like to hear what you think. That Strickland's can be addicting. But since it isn't Fro-yo it's a dangerous addiction. Still waiting to go for Roma D'Italia (it's the only Italian place on my list of joints to try). But Italian food, for some reason, always gets bumped for some other spur of the moment craving. Man, we need an Asian film festival at UCI...the Asianest college in California! Ah yes, Taiko. I've been many times during my formative years at UCI. Except I've always done the combos, which I thought were alright, but not mind-blowing -- and that line! What's up with that line!? I'll have to check out the sushi bar per your recommendation. Secret menus are always fund to discover. I think Taiko is vastly overrated and certainly not worth waiting in the long lines. OT, Elmo, every time I decide to go to Zon Baguettes, I get sidetracked. Still haven't managed to get there yet. Since I'll be in Europe for a couple of weeks, I'll try to get there the end of August. 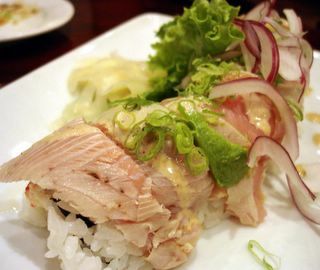 Great review,as always.What are your thoughts as to S. Sushinoya,your local sushi joint...it's mine as well,although I've only tryed it for takeout.Had the seafood salad which was only adequate.Wasa sushi in the Marketplace is also a good option in the area.Do you have a preference? 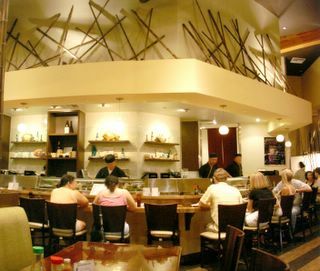 Interestingly, S. Sushinoya is one of the two Japanese places in Irvine I *HAVEN'T* tried. I'll probably be trying it soon though. WaSa, I have tried. And I liked it. They're probably one of the better choices in Irvine for unconventional rolls, and their clientele seems to consist of trend-setters which means the prices have to match. Although I much prefer their rolls to their "Treasures". My complaint about the "Treasures" was that the sauces used seems to overpower the delicate flavor of nigiri. In that regard, I guess I'm a nigiri purist. we've been visiting mitsui often a while ago. They raised the price over these few months. we suspect that they've changed the owner. The noodles tasted not as good as before (actually bad). but it looks that the sushi chef are the same (not confirm, since we don't eat sushi). for these reasons, this is not a place we managed to visit again. They have indeed changed ownership. I used a coupon that was attached to a big full page ad on Clipper Magazine and it proclaimed, in big typeface "Under new Management". Seeing as how this was our first visit, I, unfortunately, could not tell whether it has improved or declined from the previous owners. But I did notice that the prices are generally steeper than other Irvine sushi joints. 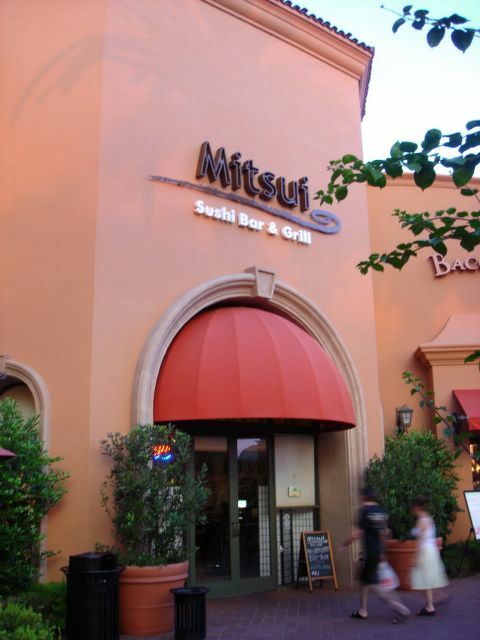 I live in Quaill Hill and my friends and I have been to Mitsui a few times. I only can say it has been rather disappointing there. The food and prices are pretty much like these cookie-cutter, Irvine Company leased restaurants. Like someone else posted earlier, I would HIGHLY recommend Ango Tei. However, you have to either get there really early, or wait an hour to an hour and a half for a seat. But it's well worth the wait. Great review and keep up the good work! Try this place in Costa Mesa, "Tentation", good place for happy hour and clubbing on the weekend. I love their sushi (only cooked meat tho') and the scenery not too bad either. Thanks again for the blogs!! Loving it!! I don't know how often they have it, but their fresh Spanish Mackeral was excellent, and the presentation would make it even better for one of your photos. My husband and I love japanese food. We have been trying out many places and so far.. From all those japanese restaurants (that's not owned by Japanese ppl. meaning the sushi chef and waitresses are not Japanese).. was MITSUI the WORST!!!!!!! The food was not authentic and not fresh... I did some research about this place later because we both didn't feel well after dinner..
And I found out that this place was closed for quite a time because of insanitary environment that can cause food poisoning..
here is the link... I would definitely not recommend this food place.. service is rude and the food is to overpriced and pretty bad..
We ate sushi here on Friday 02/01/08 and my wife got food poisoning (first time ever - anywhere. We're calling the OC Health Dept.